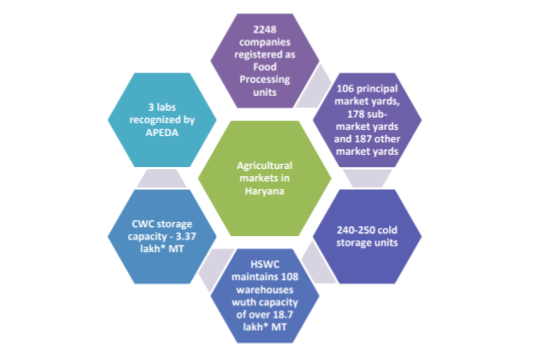 With only less than 1.4% area of India, agriculture sector of Haryana contributes 15% food grains to the central food security public distribution system and 7% of total national agricultural exports including 60% of total national Basmati rice export. The Green Revolution along with the completion of Bhakra Dam and Western Yamuna Command Network Canal System resulted in the significantly increased food grain production. Livestock Industry: Being the 8th largest producer of milk and 1st in the inland fish productivity per hectare per year, the state shows great potential for milk processing and fishery industry. Also, Haryana is in top egg-producing states in the country. Agriculture including crop husbandry and dairy farming is the main component contributing about 93 percent in Gross state value added (GSVA) of Agriculture and Allied Sector. Cereal Processing Industry: A major producer of crops such as wheat, pearl millet and barley, the state is an ideal destination for cereal processing industries. Oilseeds Processing Industry: Sunflower, Rapeseeds and Mustard are among the popular oilseeds grown in Haryana. They can be further processed to manufacture oil. Fruits Processing Industry: Establishment of such industries would help to increase the shelf life of fruits and hence reduce food wastage. Fruits such as kinnow, mango, guava, strawberry, bael, peach, ber are among the commonly grown fruits in the state. Spice Processing Industry: Spices such as fennel can be used to make aromatic components and fenugreek is useful as a fiber supplement. The state has 31 industrial estates, 4 mega food parks, seven operational SEZs, 6 completed cold chains, testing labs recognized by APEDA and several research facilities at educational institutes such as NDRI (National Dairy Research Institute) and NIFTEM (National Institute of Food Technology Entrepreneurship and Management). 65% of its population engaged in agriculture. Gross cropped area is 6.51 million Hectare and the net cropped area is 3.64 million Hectare with a cropping intensity of 184.91%. Ideally located nearer to NCR with access to market and the international airport. One of the economically well-developed regions in South Asia. To generate more jobs, increase GDP growth rate and promote balanced regional development through geographical dispersal of industry and to attract investments, the State Government has provided special incentives under the Enterprises Promotion Policy 2015. Subsidy on interest, capital, investment and power tariff, exemption on excise duty and electricity duty are among the few of them.